We are delighted to be making a return visit to The Ravenswood Hotel for this year’s fund-raising event, which proved so popular with you all in 2015. We hope you will be able to join us to help raise money for such a deserving charity - Guide Dogs for the Blind Association. As well as a three course, sumptuous meal and good company, we have some superb entertainment for you to enjoy in the form of The Silhouette Show. The Silhouettes are a three-part vocal harmony group who have a shared love of retro and vintage music. They have created an “Andrew Sisters-esque” performance that delivers all the hits of the day from Vera Lynn to Elvis Presley, from Billie Holiday to the Temptations, and everything in between. In their vintage glitz, and with their playful choreography, The Silhouettes will take you from 1900 to 1960 and will undoubtedly have you tapping your feet! Prior to the event, Christine Goose (Tel. : 01444 453018) will be co-ordinating the sale of raffle tickets and personal donations. 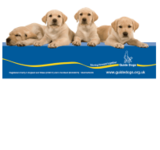 If you wish to make a personal donation please make your cheque payable to "Guide Dogs". We have some amazing prizes that have been donated by a variety of local venues and suppliers, including lunch in France for two people, a family ticket for the Royal International Horse Show at Hickstead, a pair of tickets for Hever Festival Theatre and many more. The full address of The Ravenswood Hotel is Horsted Lane, Sharpthorne, West Sussex, RH19 4HY and we will be in the Princess Beatrice Suite. Selection of Cheeses with Relish, Pickles, Savoury Biscuits. Please confirm your attendance to Sue Russell by 31/03/19, enclosing a SAE or email address if an acknowledgement is required. Cheques will be banked on or after June payday. N.B. Final numbers will be provided to the venue on 14/06/19 after which, we are unable to provide any refunds.